Now are you paying attention? The market sure did yesterday when Trump said he wants to move ahead with his plan to impose $200Bn of additional tariffs as soon as next week, just two days after tweeting that he and President Xi would work out their trade deal, which drove the market to new highs. Companies and members of the public have until Sept 6th to submit comments on the proposed duties, which cover everything from selfie sticks to semiconductors. The President plans to impose the tariffs once that deadline passes. Trump cut off negotiations with China because of what he perceives as Beijing’s lack of cooperation in nuclear talks with North Korea, one of the people said. The president wants to squeeze China, believing the U.S. has leverage over Beijing, that person said. Trump also threatened to pull out of the World Trade Organization as they have not been behind his illegal sanctions so far – that alone threatens to unwind the entire Global Economy but, thank Goodness, noboday takes the President seriously when he says insane things like that. Trump also said (yes, he just keeps going) that the EU offer to scrap auto tariffs "is not good enough" meaning – well let's not pretend to know what he means but if NO TARIFFS are not good enough then I guess he wants the EU to offer incentives for their people to buy American cars? I was going to say that's Batshit Crazy but then I thought that was going to far but then I looked up the definition of Batshit Crazy and yes, Trump is BATSHIT CRAZY! We've gotta hold those highs, right? There's nothing Fund Managers and Brokers hate more than to have their clients talking about pulling money out of the market around the barbeque. With a holiday weekend approaching, we can expect all the stops to be pulled out to maintain our record highs but what happens when the big boy traders come back from their summer vacations is anyone's guess. It's all nonsense, of course but Alice in Wonderland was all nonsense for 90 minutes and then she woke up. It's hard to say when investors will wake up but they usually do at some point but, as I noted yesterday, things can get a lot sillier before they get saner. 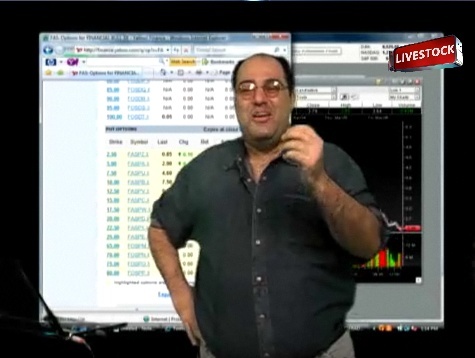 Oil (/CL) is hitting our silly target of $70 this morning and we discussed shorting at this line in yesterday's Live Trading Webinar and I reminded our Members in Chat this morning that we are shorting below the line only, with tight stops above but I'm willing to lose a few Dollars while wating for the nice, post-holiday pullback we're expecting. Oil and Gasoline (we're short that too) are things that are bought by the masses, not just rich folks and, although our GDP is expanding at 4.2% in Q2 and people like us (who have enough savings to be able to play with stocks) are feeling pretty good, economically, a new study by the Urban Institute reminds us that 4 out of 10 Americans are struggling to pay for their basic needs such as groceries or housing. It's a problem even "Middle-Class" households confronting. Up and up she goes! I misseed a lot of the rally in 1999 as I thought a double at 3,000 was a bit much and I sat there with my arms crossed, cluck-clucking at all the fools who rushed in for the next 1,800 points but a lot of those guys got very, very rich chasing those crazy stocks and some of them got out ahead of the crash but my takeaway from that was to just be patient, make a bit of money on the way up but I find I'm far more comfortable using that money at the bottom to pick up value stocks for the long-term. 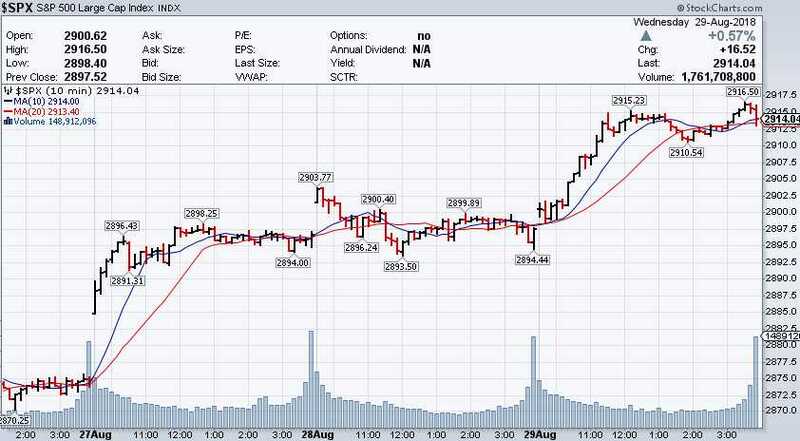 Toppy Tuesday – S&P 2,900 so it’s 3,000 or Bust! 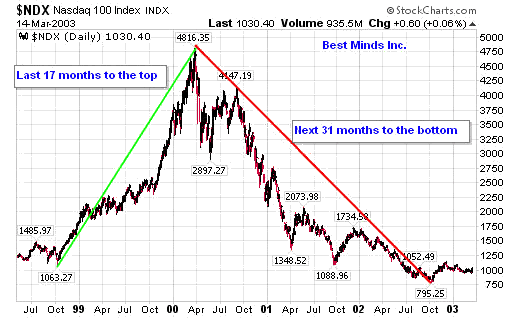 As you can see from the chart on the right (click for bigger view), people have been saying this rally is going to end since it started – and that was about 10 years ago at this point! I'm included in those people as, on several occasions, including this year – I have wanted to cash out and, in fact, I did cash out my kids' college accounts into the Summer (still in cash) and our Hedge Fund is mainly in cash as well as we wait for the market correction (and buying opportunity) that never seems to come. Being cautious hasn't stopped us from making money but we certainly could have made more money if we hadn't hedged (and yes, we just put more money into hedges yesterday). Still, that's not the right way to play but we do need to make some realistic assumptions about where the bottom of this new range should be and it's probably not 2,200 on the S&P – which would be a 24% correction from here. http://welcome.philstockworld.com/wp-content/uploads/2015/09/PSW-Adooma-logo.png 0 0 Phil http://welcome.philstockworld.com/wp-content/uploads/2015/09/PSW-Adooma-logo.png Phil2018-08-28 12:31:522018-08-28 12:31:52Toppy Tuesday – S&P 2,900 so it’s 3,000 or Bust! 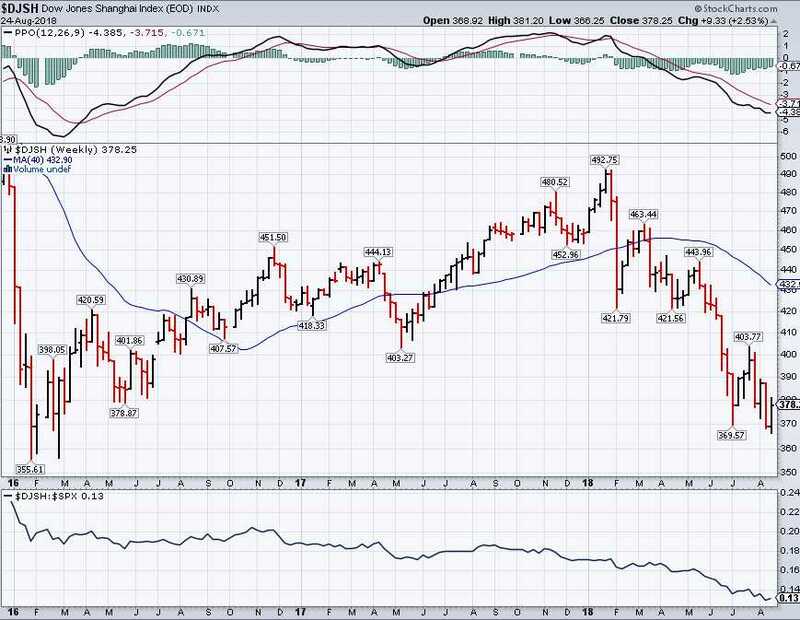 Monday Market Movement – NAFTA “Fixed”? Of Course, that calls for a RECORD HIGH! 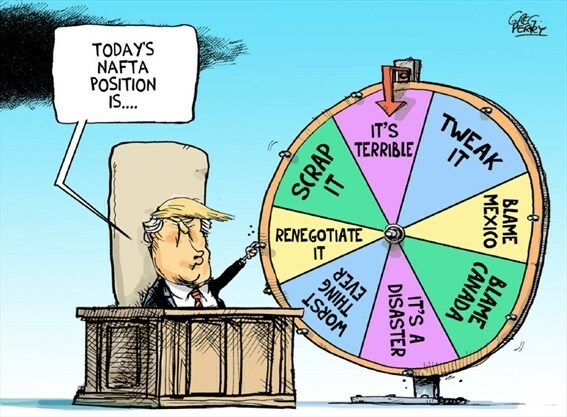 We're finishing August off with a bang as ANY news is good news these days, even making progress on keeping NAFTA, which Trump promised to throw out and was enacted almost 25 years ago (Jan, 1994) so the only reason there's an "accomplishment" to fixing it is because Trump broke it in the first place. Of course the Administration will say they won big concessions but so will the Mexican Administration and, so far, Canada isn't even playing with Trump – so it's not really "fixed" at all. It doesn't matter though as the Dow (/YM) is up 140 points (25,927) and the Nasdaq (/NQ) is up 35 points (7,530) in the Futures along with 2,887 on the S&P 500 (/ES) and 1,730 on the Russell (/TF), which also well above the June high of 1,708, depsite the weakening Dollar and rising oil prices ($69), which are considered bad for small-cap stocks. Word of progress on NAFTA lifted Asia's stocks as it's seen as more likely the US will begin to negotiate with Japan and China and China's Central Bank took steps over the weekend to strengthen the Yuan, sending their market up 2% overnight – another reason our Futures look so good at the moment. That's despite the fact that China's Industrial Profits continued to cool off, down to $75Bn in May from $93Bn in June. There's also some alarming internals as Producers and Refiners of raw materials like oil companies and steel mills have accounted for roughly 2/3 of the gains this year. 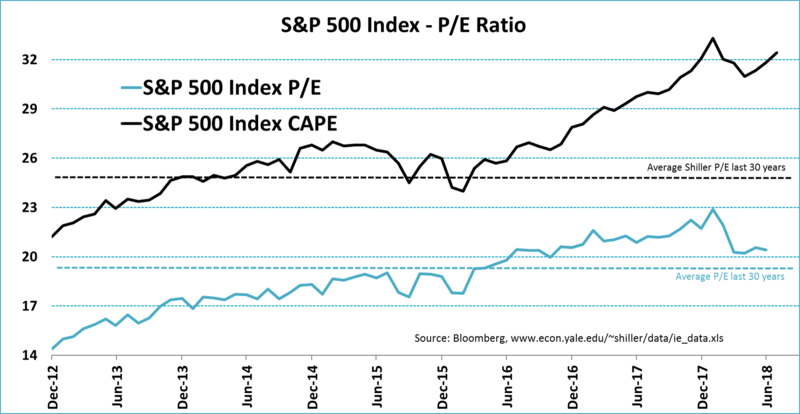 Smaller firms are facing much tougher business conditions that are squeezing profit margins. Despite this morning's 2.5% rally, China's Shanghai Composite still has a long way to go before recovering, after falling 25% from 492 to 379 since topping out in January. It will take 5% just to make a weak bounce off that so 390 will be the line to watch and then 410 would be a real recovery at the strong bounce line. http://welcome.philstockworld.com/wp-content/uploads/2015/09/PSW-Adooma-logo.png 0 0 Phil http://welcome.philstockworld.com/wp-content/uploads/2015/09/PSW-Adooma-logo.png Phil2018-08-27 12:34:222018-08-27 12:34:22Monday Market Movement – NAFTA “Fixed”? Of Course, that calls for a RECORD HIGH! The WSJ says: "U.S.-China Trade Talks End With No Sign of Progress"
As we predicted, trade talks between the U.S. and China failed to produce any visible sign of progress, reducing the prospects of a deal soon, people closely tracking the talks said. The statement was significant for what it didn’t say as well, people said after the talks. There was no discussion of follow-up talks or any accomplishments. For now, the U.S. continues to turn to tariffs to pressure China. As negotiations wrapped up on Thursday, the U.S. put in place $16 billion in tariffs on Chinese goods, raising the total to $50 billion. The Chinese have matched them dollar for dollar. Public hearings continued on U.S. plans to hit another $200 billion in Chinese imports with tariffs as high as 25%, which would place levies on about half of Chinese imports. If the U.S. continues on the same schedule as in the past, those tariffs could start to take effect in September. As I explained in yesterday morning's report, Trump has no interest in ending the Trade War with China as these "tariffs" are nothing more than a 25% tax on consumer goods purchased by the average American which fund tax cuts for the above-average American, who are better than you because they have more money – so don't complain! 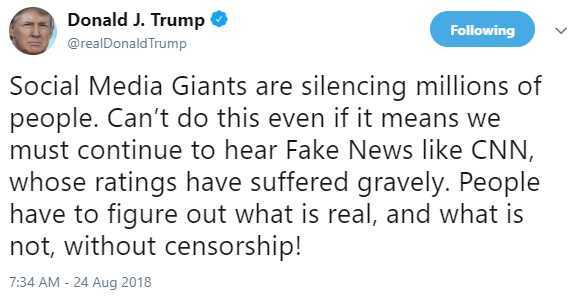 President Trump is complaining that Twitter, Facebook and others are cracking down on Russian Hackers, White Nationalists, Hate Mongers and Bots which spread Fake News in Social Media (often from Russian Troll Farms). It may be difficult for Republican Congresspeople to get elected without all the fake news and fake supporters and, of course, it's a fantastic distraction as the real news flow is turning towards articles of impeachment as more and more of Trump's inner circle is convicted or "flips" on him – something else he's been complaining about. 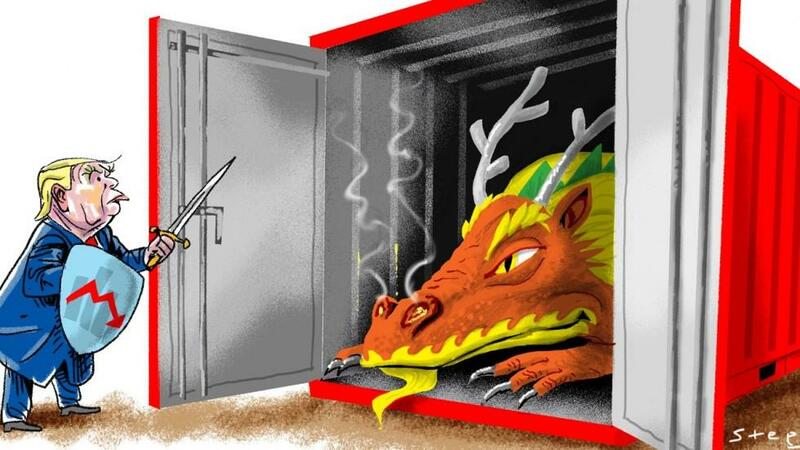 "U.S. Seizes on Chinese Economic Vulnerability in Trade Talks." That's the headline in the Wall Street Journal this morning and, frankly, that's NOT the way to enter into a negotiation. Of course the WSJ has drunken all of Trump's Kool-Aid and they think he's a master negotiator who gets the upper hand by bullying and insulting the people he is dealing with so that, when he makes even the smallest concession, they are thrilled to accept it. That may work in real estate, where you can burn bridges and move on but this is Geopolitics and those are the same countries you need to do business with tomorrow – you can't just screw everyone over without repercussions. As the "failing" NY Times (BOO, fake news, BOO!!!) 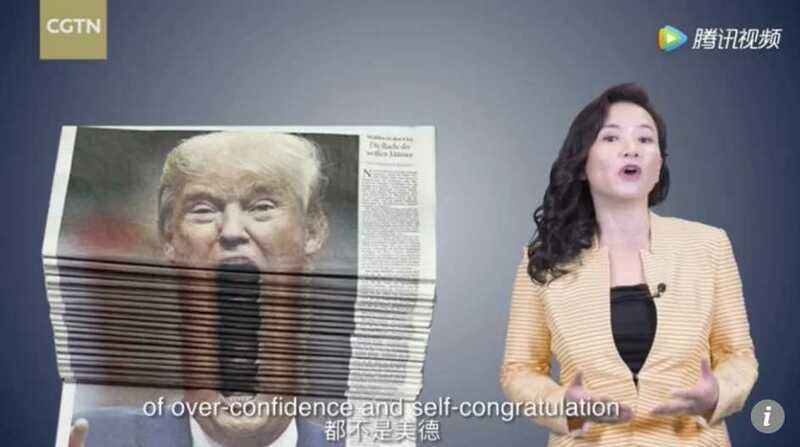 noted yesterday, Chinese state media has been putting out videos depicting Trump as a bumbling bufoon of little consequence, releasing one video thanking President Trump for helping make China stronger. It shows him in unflattering poses, his brow furrowed and his mouth agape. Its sarcastic title: “Thanks Mr. Trump, you are GREAT!” “They sense his (TRUMP's) increasing domestic weakness and see a chance to pile pressure on,” said Kerry Brown, a professor of Chinese politics at King’s College London. Sadly, I had to insert "(TRUMP's)" in that quote because SOME people in this country are so brainwashed that they don't even know Trump is weak or that he's already expended all of his political capital and may be taken out of the oval office in handcuffs in the near future and they actually believe it's possible that Trump is the one negotiating from strength. It's amazing, but it's true! Keep in mind, this is China's state-run TV that's mocking Trump – that is not something they are likely to do if they are about to bend over for him in trade talks this afternoon more tariffs have already been put into effect as of 12:01 this morning! More likely, today's negotiations will go something like this SNL classic from the Obama years. For a minute anyway – that's how long the S&P 500 held its new record high (2,873.23) for before falling steeply back down to the 2,850 mark and, this morning, we're bouncing back to around 2,860 as more Members of Team Trump are convicted of crimes that the President knew nothing about and didn't discuss and doesn't believe and WITCH HUNT!!! I think, usually, in a "witch hunt" the prosecutors don't find so many actual witches, do they? Webster's actually defines "Witch Hunt" as: "The searching out and deliberate harassment of those (such as political opponents) with unpopular views." That's not quite the same thing as the actual uncovering of a culture of graft and corruption as well as uncovering evidence of collusion indicating possibly treasonous actions against the United States of America carried out by a political candidate and his family in an effort (successful) to steal the Presidency. Stock Market Crash – Year One Review III – March Madness! Which Way Wednesday – Happy Crashiversary! ?As of tomorrow, this will officially be the longest bull market in US history but it is VITALLY important to Trump and the Republicans that it continue until November, when the GOP can ill-afford to have you pulling levers while seeing red in your portfolios. There's only so many votes a Russian hacker can change in one day, you know! To that end, Trump has now called for a weaker Dollar, publicly complaining about the Fed's tighter monetary policy and saying the Fed should help him do more to boost the economy – never mind that that's not at all what the Fed is supposed to be doing. So far, Trump has the Atlanta Fed's Bostic in his court and Bostic has now said he will dissent against further rate hikes to prevent the yield curve from inverting. Trump has also accused China and the EU of manipulating their currency to make it weaker – giving them unfair trade advantages (it makes their exports to the US cheaper – as if the US is the only person they trade with) and all that has combined to take the Dollar down over 1% in the past week, which then reprices the market up 1% (since we buy stocks in Dollars) giving Trump the same "unfair" advantage he accuses Europe of when measuring HIS rally (the one he's been here for the last 585 out of 2,200 points of). No big news over the weekend other than more scandals in Trump Land – but what else is new over there? 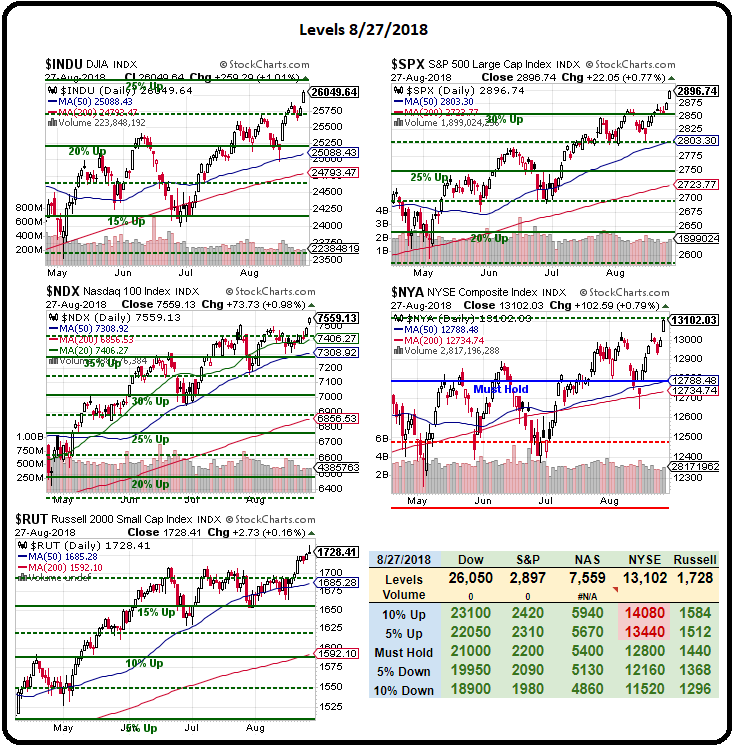 As we noted on Friday, the Dow is still miles away from retaking it's February highs so our attention is currently focused on the S&P 500 at the 2,850 line, which is 30% over the Must Hold Line at 2,200 and our February high on the S&P was 2,872.87 on Jan 26th but, sadly, two weeks later (Feb 9th) we were back at 2,532.69, a drop of 340.18 (11.8%) in 10 trading sessions.